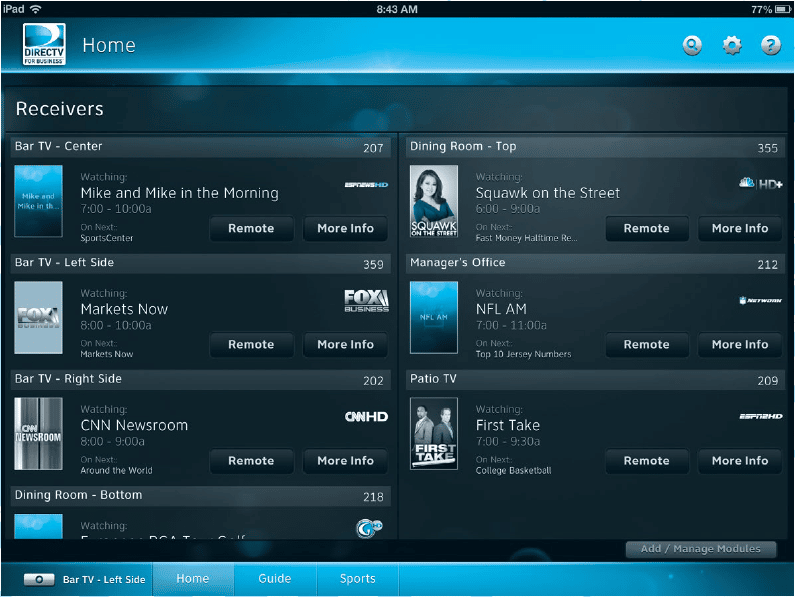 DIRECTV iPad App Now Available for Commercial Customers! Bars, Restaurants and other commercial DIRECTV customers with multiple TVs have something to be excited about now, the new DIRECTV iPad app! It is the ultimate video management tool for DIRECTV Commercial customers. The new DIRECTV Commercial iPad is available for Public Viewing, Business Viewing and Private Viewing accounts. Best of all the DIRECTV Commercial iPad app is free. Why Does Your Bar or Restaurant Need the New DIRECTV Commercial iPad App? The new Commercial DIRECTV iPad app allows you to control ALL of the TVs in your Bar, Restaurant, Fitness Center or other business with just one iPad. A DIRECTV.com login for your commercial account. If you haven’t already set up yours, simply go to DIRECTV.com/apps and create one. It’s similar to the process you used to set up your account at home. All your DIRECTV receivers need to be connected to the internet. Its easy to check to see if your HD DIRECTV receivers are networked and connected to the internet. Just press the DASH button on your DIRECTV remote. The screen should say, “SWiM Connected” and “Internet: Connected”. If it doesn’t, give us a call at 505-296-9423 and we can work with you to get the current-generation HD equipment you’ll need, get it installed for you, and get you started using this amazing iPad app. The iPad requires a wireless connection to the internet, so you will need a wireless router to provide that internet access. To find out more about the new DIRECTV iPad app for commercial or to upgrade to the current generation HD and SWiM equipment installed, contact us for a free site survey.